Vintage Christmas Seals, what's the deal? A few years ago when I was getting started in the vintage stamp business, I accidentally bought a large lot of Christmas Seals thinking that I was buying a large collection of Christmas stamps (oops). 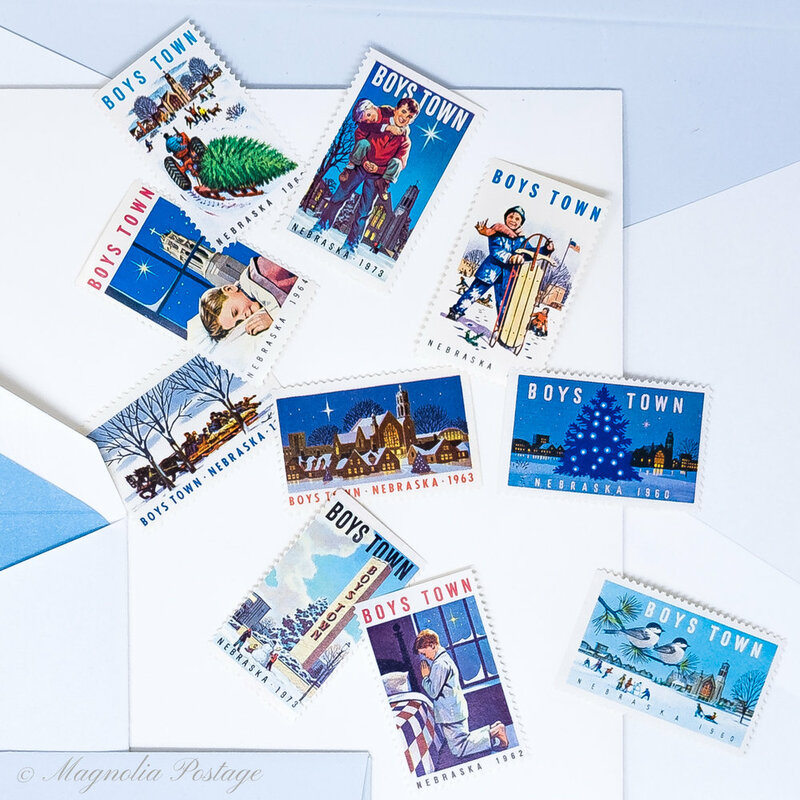 When the holiday seals arrived I found myself saying, “huh, that’s strange, why don’t these stamps say how much they are worth?…” which was when the realization set in that I hadn’t bought vintage Christmas stamps at all. Lesson learned: seals and stamps look very similar - but Christmas seals are definitely NOT postage stamps. … just not on the front of your envelopes. The first Christmas seals were created in Denmark in 1904 when a Danish postal clerk named Einar Holbøll was looking for a way to raise money to help sick children with tuberculosis. Throughout the 1600-1800s in Europe, TB caused 25% of all deaths. Similar numbers were reported in the United States . Tuberculosis was a disease with a massive impact on populations and its impact on children was particularly cruel. Though TB rates have gone down over time, especially in the US where a total of 9,105 TB cases (a rate of 2.8 cases per 100,000 persons, or %0.0028) were reported in 2017 , TB is still one of the most common major infectious diseases in the world. More than 4 million Christmas seals were sold in Denmark that first year, and the trend was subsequently picked up by other countries. Soon after Denmark issued the first Christmas seal, many other European countries followed suit with the majority of all TB seals issued around Christmas time. Many of the Christmas seals included the international symbol against TB, the double barred Cross of Lorraine (you will see that red symbol on most older Christmas Seals). Christmas seals were introduced to the US by Emily Bissell in 1907 when she was looking to raise funds to save a sanitarium in Delaware that was on the verge of needing to shut down. Bissell had heard of the success of Christmas Seals in Europe and she designed and printed special holiday seals to sell for a penny each at the post office. In 1987 the American Lung Association acquired a US trademark for the term "Christmas Seals" to protect their right to be the sole US national fundraising Association to issue them, and Christmas Seals are still released annually to benefit the American Lung Association. Today, there are nearly one hundred different lung associations worldwide that issue Christmas seals. Many different countries issue their own Christmas seals, as well as cities, states and territories. Additionally, many other organizations and charitable funds (e.g., religious organizations, civic and fraternal societies, patriotic organizations, sororities, etc.,) issue seals around the holidays, often designed to portray Christmas themes. Since these seals are not issued to fight tuberculosis, they lack the double barred cross of Lorraine, the international symbol for the fight against tuberculosis. Vintage holiday seals are a fantastic way to not only dress up your holiday cards and support a good cause, but also to ensure that the back flap of your envelope stays closed. Christmas seals don’t need to be constrained to an envelope though, you can use Christmas seals to attach gift tags, hold gift wrap and ribbon in place on gifts, or just generally to dress up a greeting or note to someone who will appreciate the vintage touch.